A few thrifted finds. Green glass. 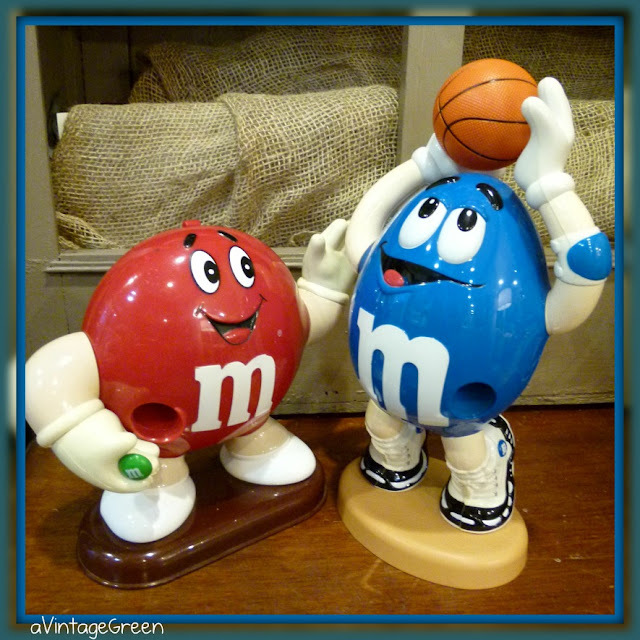 M and M figures. A Charlie Brown Christmas Record. A visit from Peaches. Life is good. Vintage green glass. Both about 9 1/2 inches tall. Useful. Seasonal (useful for St. Patrick's Day as well as Christmas and spring bouquets too). Always a bit of fun - M and M figures. Humour. Vintage record, obviously used a lot, the cover edges are mostly worn through. It has copyright 1977 on the red front. The book inside has been well used too and many pages are loose. The record will need some judicious repairs to keep everything intact. Peaches is not part of thrift finds but nevertheless a treasure. This dear one watches and naps while I work, keeps me company in the garden, chases balls and leaps and dodges as if she were 5 years younger, ends games by taking the ball and going into the house, helps clean up spills especially little bits of meat. Doesn't like pea pods but will eat carrots. Goes to school every day with DGS in the back seat and rides home again. Sleeps on my bed when I am not home (cozy warm indentation gives her away every time). Rarely barks except a couple of sharp barks to warn of strangers. Can push open doors but never closes them. Loves a good brushing (excellent shedder). Peaches is about 9 years old now. She belongs to DGS and he is her third owner. 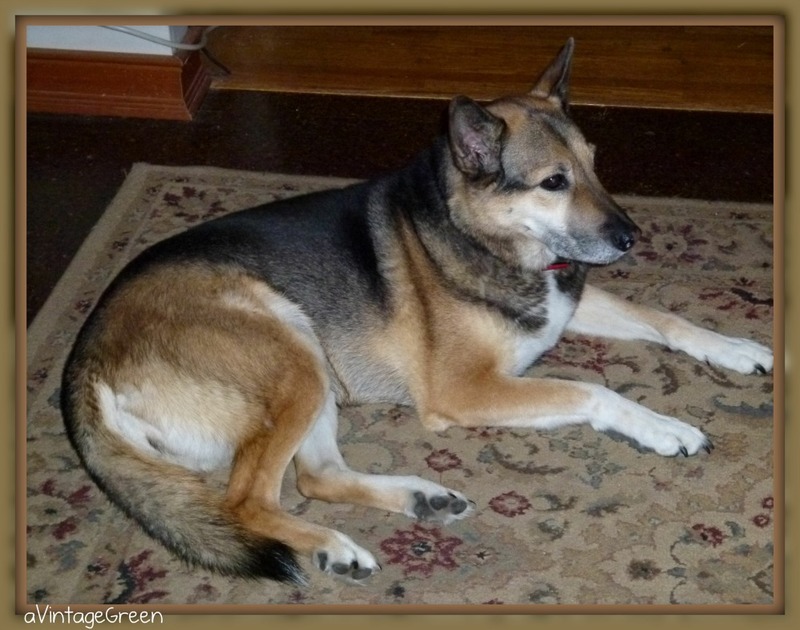 She is voice and hand signal trained for the essential basics (likely by her first owner). I hadn't considered being grandma to a dog but I do enjoy her company and her very loving nature. She goes where DGS goes (except in class of course, then she is all mine). Peaches looks (and sounds) like a Sweetie! Lve the M&M figures - what kid wouldn't like those in their bedroom?! Great looking treasures. I love the green glass. I would love to hear the LP's. Oh, sweet memories. 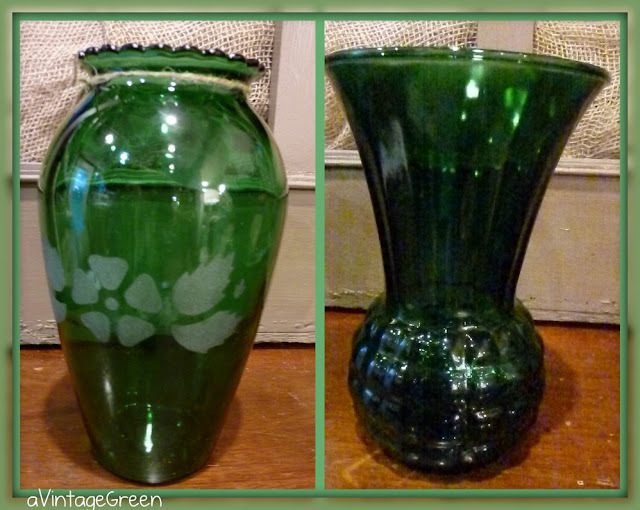 Ooooh, I love that green Anchor Hocking vase! have a ruby red to match, minus the etching of course.